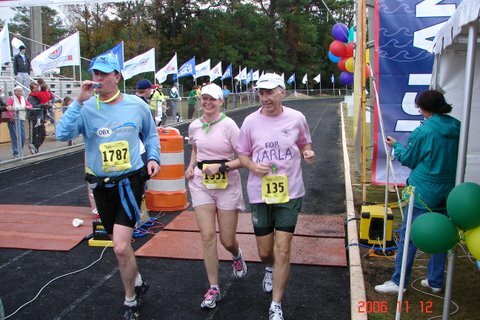 I am very excited to be returning this weekend to run my 4th Outer Banks Marathon! Training has been going very well this Fall and if all goes well I hope to run my 2nd fastest marathon time. I'll be aiming for 3:40, the same as I tried at Lehigh Valley. Hopefully the weather conditions will be a lot better for this race and the forecast is promising. I really hadn't planned on running this one again this year but if things go to plan , I will not have a chance to come back for at least a couple of years so I decided to go ahead run it again. This is the 5th year of the race and so far the only one I missed was in 2008 when I ran Mountain Masochist with Jenn, or at least the first 33 miles of it. The funny thing is that I hadn't planned on running the first one but as I explained in my race report which you can read here. I only decided to go at the last minute so I could run with Karla. In many ways that race was even more amazing than her Boston finish as this came after all the months of chemo-therapy and now she was into radiation treatments and had done almost no running all Spring and Summer. The picture is our finish in 2006. This year I'll be racing on my own. Karla will be running her fifth and hoping to run well also. I will be staying with the Howells again and I expect my other training partner Lisa will blow out an amazing time and get a big PR the way she is running lately. And my newest training partner Amy has been making huge improvements the past few months since joining us on our long runs and track workouts so I expect she will also run well in her 2nd marathon and first at OBX. Looking forward to some fun times with good friends and hope to see some others from the area there too. Here is the race website. Stay tuned for the results !